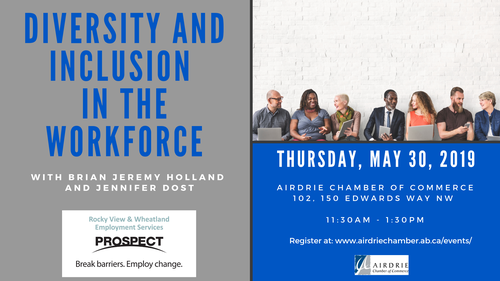 Diversity and Inclusion in the Workforce provides an introduction to the diversity of the Canadian workforce and the reasons that inclusion is important to buisnesses. Presenter: Jeremy Holland has worked in both the private sector and the human services sector. He has over 10 years of experience in human resources and a bachelor's degree in psychology. In his work with Prospect Human Services, he has supported clients from a wide variety of demographics including those with mental health conditions or experiencing mental health challenges. Presenter: Jennifer Dost is a Work Force Advisor with Prospect, Rocky View and Wheatland Services and she has over 10 years of experience in the private sector working with individuals with physical and mental health challenges primarily in the area of employment. She has worked with Prospect Human Services for 2 years in Rocky View and surrounding area. Jennifer holds a bachelor's degree in Community Rehabilitation and is passionate about developing strong relationships and helping employers attract and retain great employees. Outside of work Jennifer can be found hiking, reading or spending time with her family.